These traditional pancakes are the perfect way to shake things up for the holiday. 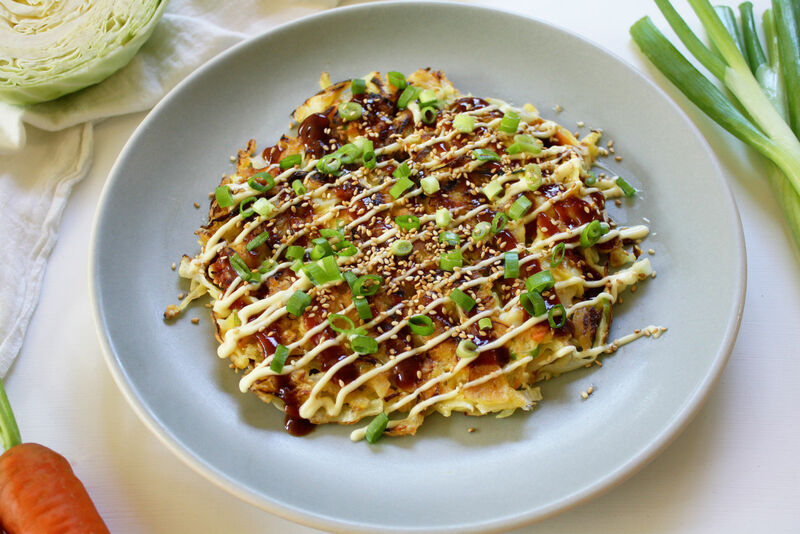 The Japanese word Okonomiyaki is derived from two words: okonomi “how you like it” and yaki “grill.” Okonomiyaki is a customizable Japanese savory vegetable pancake. Like a latke, it gets cooked in oil in a fritter formation. Unlike a latke, it’s usually made into a large plate-sized pancake comprising mainly cabbage. Food historians have linked the rise in popularity of okonomiyaki in Japan to World War II, when rice was more scarce and this recipe offered a filling meal or snack with a wheat-based starch. Throughout Japan there are regional differences and countless variations of okonomiyaki, but the most common form of the dish involves a batter made of flour, a variety of mountain yam, eggs, shredded cabbage, green onion, dashi and often the addition of pork belly. It gets topped with its own tangy sweet sauce, Japanese mayonnaise, and bonito flakes (katsuobushi). I am a fan of all pancakes and fritters, and I set out to modify the classic Japanese version for a recipe that didn’t require access to a specialty food store, and that could be made with kosher ingredients. Full disclosure: My version lacks authenticity. If you’re going for the real deal you’ll need a batter made with an okonomiyaki flour mix, or nagaimo yam; this special kind of yam is added in powdered form to the flour mix, or gets grated fresh into the batter. The toppings should include bonito flakes, and the batter should be made with dashi. These ingredients can be found at most Japanese markets. Instead of nagaimo yam, my version uses a batter of flour and potato starch, and instead of dashi I use water. I’ve also included a recipe for homemade traditional okonomiyaki sauce that can be made simply with easy-to-find ingredients, but you can also buy a pre-made bottled sauce. You can make these pancakes large-sized and cut into wedges like the Japanese do, or slightly smaller à la a large latke. I wouldn’t go too small with this, as the vegetables tend to hold together better en masse. This recipe doesn’t need to be too exact, and it works as a blank canvas for additional vegetables like kale, mushrooms and/or daikon. In the spirit of Hanukkah, these okonomiyaki get cooked in oil, but they’re not heavily fried. 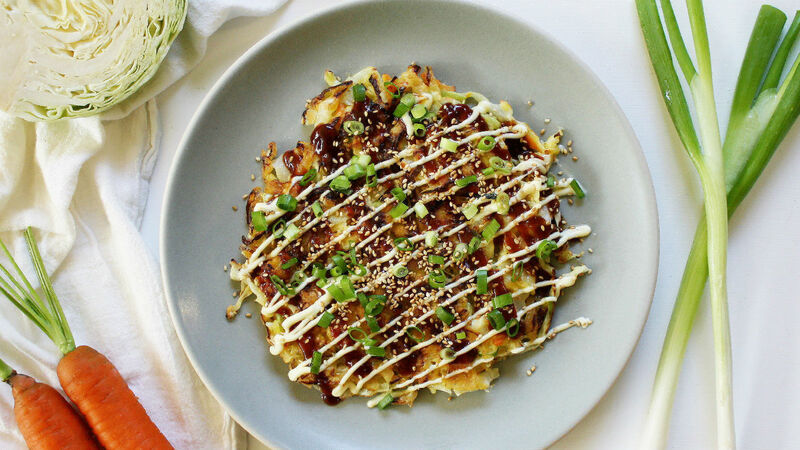 The oil used to fry the okonomiyaki gives a loving nod to the miracle of the oil glowing in the Temple for eight days instead of one, but the heap of vegetables and addictive sauce make this a nutritious and satisfying addition to any Hanukkah meal. In a separate bowl beat the eggs. Add the eggs and ½ cup of water to the flour mixture. Whisk until smooth. You want a fairly thin, crepe batter-like consistency. If you find it too thick, add another ¼ cup of water. Try not to over-mix; you do not want to overdevelop the gluten. 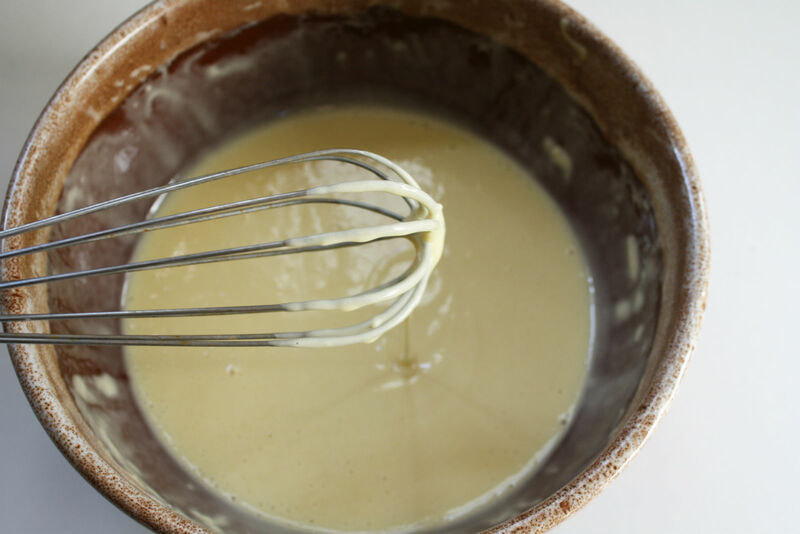 Allow the batter to rest in the fridge for 30 minutes to an hour. While the batter is resting, prepare the vegetables. Remove the thick core from the cabbage half, then cut the halved cabbage in two. 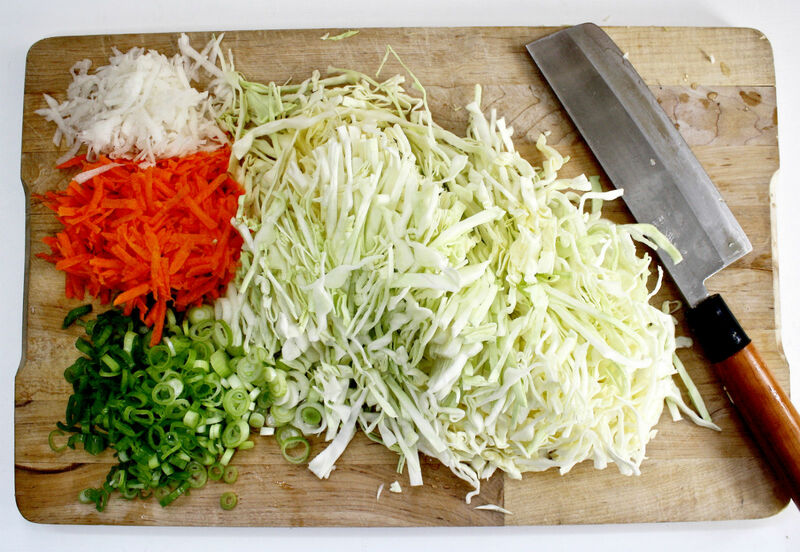 Thinly slice or shred the cabbage. Thinly slice the green onions. Grate the carrot and daikon if using. Make the okonomiyaki sauce: Combine the ketchup, Worcestershire, soy sauce, and honey/agave in a bowl. Taste and adjust to your liking. The sauce should be tangy, savory and a little sweet. Heat a cast-iron skillet or a nonstick skillet with about 3 tablespoons of oil over high heat. Once the oil is glistening and hot, lower the heat to medium low and add some of the cabbage mixture to the pan, gently nudging it into a circle shape. I like to make each pancake with about 2 cups of the mixture. For me, that makes an ideal-sized pancake that isn’t too hard to flip, and one that will hold together. Cover the skillet with a lid for 3-4 minutes. Carefully flip over the pancake, and cover it with a lid for an additional 3-4 minutes, or until browned on both sides and cooked through. Make sure not to cook on too high of a heat or the pancake might burn on the outside while remaining raw in the center.